The Elgato Thunderbolt Drive+ is the new device from Elgato, which features the most advanced and most common connectivity standards thus ensuring a revolutionary high-speed solution. It can attain lightning fast transfer speeds of up to 420 MB/s according to the manufacturer’s specification. It is very portable being powered by the bus-powered technology. Their primary connection type is the Thunderbolt connectivity, USB 3.0 and is also compatible with USB 2.0. The drive is fitted with the server-grade Plextor SSD technology which offers silent operation mode as it contains no moving parts. The packaging of the drive includes the Elgato Thunderbolt Drive+, Elgato Thunderbolt cable, a backward compatible USB 3.0 cable to ensure connectivity to virtually any computer, the protective port cover and the user guide. The Elgato Thunderbolt SSD Drive+ is made of a simple layout, aluminum casing that is solid black and rectangular in shape. The enclosure might not appear to be the most attractive but the metal is rigid and robust. It has two ports on the top edge one for the USB 3.0 and the other for Thunderbolt connectivity with each being marked clearly. It also has the protective port cover for ingress protection and attains an IP 64 rating; this ensures that there is no entry of dust at all while splashing of water from any direction is limited to entry and won’t affect functionality at all. The drive is averagely sized with dimensions 83mm by 131mm by 21mm and weighs 272 grams. The drive is available in two capacities of 256GB and 512GB. It is compatible with Mac OS X 10.6.8 or later for Thunderbolt connectivity, USB 3.0 or 2.0. For PC, it’s compatible with Windows 7 or later. 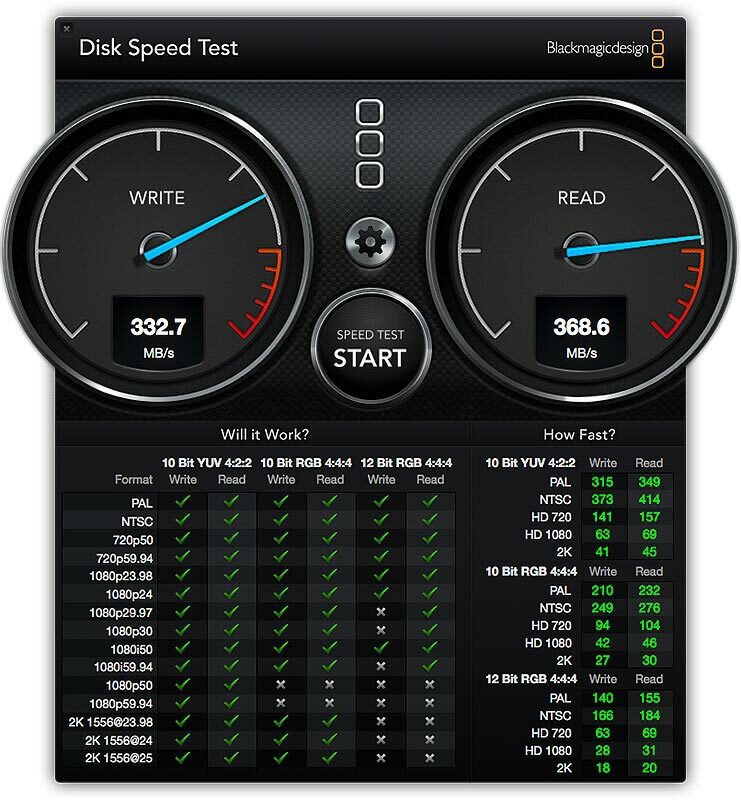 The Elgato Thunderbolt SSD Drive+ proves to be blindingly fast among its peers in the Thunderbolt league. The Drive+ uses the Plextor PX-512 M5Pro SSD, which utilizes two controllers; a Marvell 88SS9187 and the 19nm Toshiba NAND flash controllers. 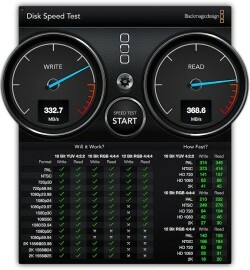 The test results of the Drive+ are impressively high worthy of transferring files in record time. The Drive+ is way ahead in transfer speeds. When testing the USB 3.0 connectivity, the writing speed of large file is 169MB per second and reading speed is 213 MB per second. Subject to the Thunderbolt connectivity the reading speed is 387 MB per second and writing speed is 331MB per second. Smaller files are also transferred at relatively lower speeds with the USB 3.0 writing the small files at 48.6 MB per second and reading the data at 65 MB per second. The Thunderbolt connectivity also transfers smaller files at relatively lower speeds to and the reading speed is 130 MB per second and writing speed has a performance speed bump and reads at a noticeably slower speed of 75 MB per second. However, when testing for the highest speeds possible with the Drive+; the USB 3.0 delivers a blistering 419 MB per second with the Thunderbolt connectivity coming in a bit slower by around 10 MB per second which is not that bad either. The Elgato Thunderbolt Drive+ is usable on both Mac and PC. The device though is formatted to HFS+ for compatibility with Mac, but a simple reformat makes it compatible with PC in Windows 7 and above. A driver on Elgato’s website enables the detection of the formatted drive as a mounted volume. 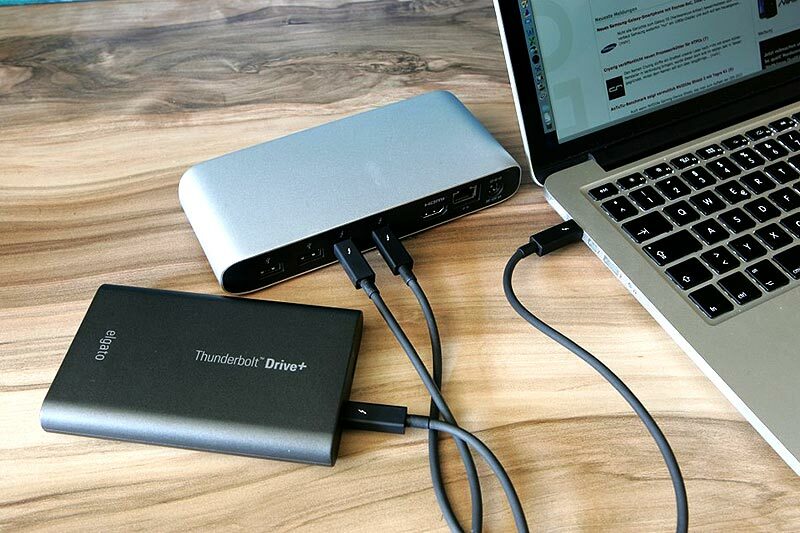 The Drive+ runs on the Mac simply by plug and play. Click and drag also runs directly. The Drive+ is bus powered and can only use one cable at a time and even if you connect both the Thunderbolt cable and USB 3.0 at a go, then the first connection is the one that will be active during use. The only limitation that the Drive+ has is that it has only one Thunderbolt port hence doesn’t support Thunderbolt 2; this means that daisy chaining with this device is not possible. This lack of the second port only means that in a daisy chain setup, the drive is only usable at the end of the chain, this is because you cannot plug another Thunderbolt device to it which is standard in designing compact drives. This problem presents a challenge if you only have one Thunderbolt port and also the mini-Display port adapter is also in use. In this instance one is forced to decide between the two devices. The Elgato Thunderbolt SSD Drive+ offers very easy setup and has amazingly super fast transfer speeds that are much greater than any typical USB2.0 and non-Thunderbolt drives. A device is a reliable option for users as it has a capacity of 256 GB and 512 GB as well as both USB 3.0 and Thunderbolt connectivity. The device is designed for users who want to experience the definitive transfer speeds, faster boot times and enhanced computer performance. The Drive+ uses the Plextor PX-512 M5Pro SSD, which utilizes two controllers; a Marvell 88SS9187 and the 19nm Toshiba NAND flash controllers.